Spawned from the darkest depths of the Abyss, the howling hordes of demonkind rise up to destroy and devour all of existence, their slavering, fiendish forms built to rend, enslave, and beguile. Whether in their horrid domains of madness in the Outer Rifts, or called forth into the material world by insane spellcasters, demons represent the fundamental immortality of the universe, evolving from sinful souls into entities both wretched and godlike, united under their vile taskmasters toward a single goal: to destroy all that mortal life holds dear. Complete descriptions of more than 40 demon lords and their terrifying realms including the demon queen Lamashtu, Mother of Monsters. New rules and special abilities for worshippers of individual demon lords. Rules for the demonic prestige class. Statistics for four new demons ready to bring the horrors of the cosmos to players' doorsteps. 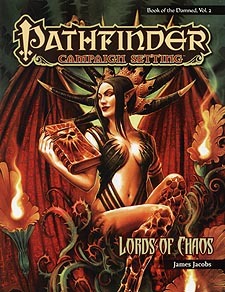 Lords of Chaos is intended for use with the Pathfinder Roleplaying Game and Pathfinder campaign setting, but can easily be used in any fantasy game setting. While Lords of Chaos is a standalone product, it also serves as a companion to Princes of Darkness: Book of the Damned Vol 1, which details the legions of Hell.